Capitalizing on the National Association for Music Education's "Celebrate Music in Our Schools Month," Apple on Tuesday launched a special promo campaign for its Everyone Can Create guides for teachers and students. 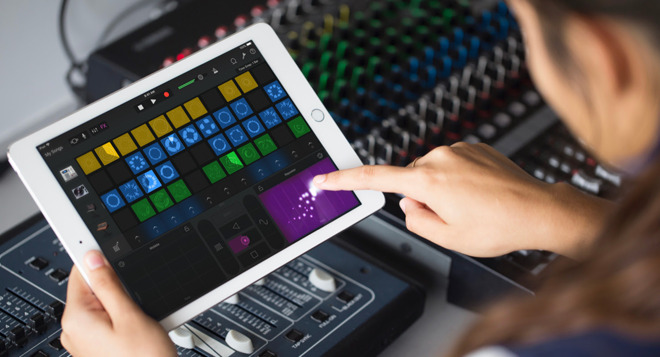 The student guide, Everyone Can Create: Music, is available on Apple Books and takes people through several musical projects on an iPad, including a drum groove, a rap, and a remix. The focus is on using GarageBand, Apple's free entry-level production suite. The book was originally published in October last year. Everyone Can Create: Teacher Guide is a broader tome covering all of the Everyone Can Create program, meant to get teachers integrating it into the subjects they normally teach. The program was first launched in March 2018, initially accessible only by schools. October marked the first time the curriculum was open to the public. None too coincidentally the program rolled out alongside Apple's 2018 "budget" iPad, which upgraded with an A10 processor and first-generation Apple Pencil support. Sans Pencil the tablet costs schools $299 apiece. Apple has been fighting hard to make the iPad an intrinsic tool at as many schools as possible, much in the same way the Apple II was a staple of many schools during the 1980s and early '90s. The company's main obstacle is Google's Chromebook platform -- Chromebooks are often priced the same or less than iPads, while offering advantages such as built-in keyboards and easy Web-based management. I have just followed the link to Everyone Can Create: Music and it is no longer available. I am based in the UK. Following my post a short while ago, it is available though by going through Apple Books. Very odd!